Replacement cast aluminium leg top for Fiamma F45 iL awnings and also fits to older versions of F45 from 450 and Fiamma ZIP awnings from 400 length. This is the top end part of the awning leg which fits in to awning leg and is connected to the knuckle joint on the lead bar. 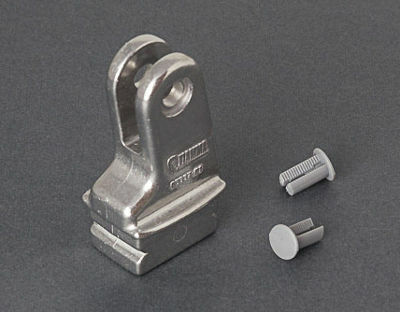 Supplied with replacement fixing rivet to fix the leg top to the awning leg as well as the plastic pin to fit it to the awning knuckle. This is the current replacement part for old part no 98655-160. This part looks different but is a direct replacement and fits the same awnings as the old part number.